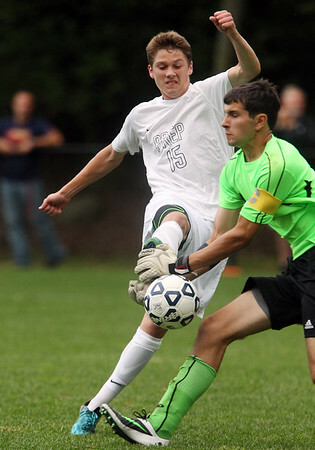 St. John's Prep senior forward Patrick Foley (15) tries to kick the ball out of the grasp of the Malden Catholic keeper on Wednesday afternoon. Foley opened the scoring for the Prep, booting home the first goal of the game with six minutes to go in the first half. DAVID LE/Staff photo. 9/10/14.